Our Waxing Survival Kit contains everything you need for a perfect wax! Makes the perfect gift for both the experienced and first time waxer! When used properly, NO-SCREAM CREAM will help ease discomfort from waxing up to 80%! Directions: NO-SCREAM CREAM should be applied 30-45 minutes before waxing. It should be applied as a fairly thick layer and should not be rubbed in to the skin like lotion. Once the cream is thick and white STOP! And let the cream absorb into the skin on its own. The skin should appear white after NO-SCREAM CREAM is applied and will absorb into the skin in about 5-10 minutes. NO-SCREAM CREAM isn’t messy or greasy, wont harm clothing and you can get dressed as usual. NO-SCREAM CREAM is FDA approved and will not interfere with the waxing process. Caution: Do not use if allergic to Benzocaine, Lidocaine, Novacaine, etc. No-Trauma Momma! helps to alleviate the trauma associated with waxing, leaving skin feeling calmer and more refreshed. This handy product also helps soothe skin after chemical peels, laser treatments and sunburn. It will also help soothe common kitchen burns even burns from hair styling devices! Directions: Should be applied 2-3 times daily prior to first hair removal and then once a day thereafter to maintain clear skin. A safe, soothing, and effective exfoliant formulated for sensitive skin. For more severe conditions, may be used twice a day. Active ingredients: Propylene Glycol (a humectant), Salicylic Acid reduces follicle blockage, antiseptic), Glycolic Acid (helps slough dead skin cells), Lactic Acid (an exfoliant), Menthol (cooling agent), Acetic Acid (disinfecting properties), and Camphor (cooling agent). Cautions: For external use only. Do not use if allergic to aspirin. Use the Microdermabrasion Scrub’Me’Luscious “Body Cocktail” for the best possible body waxing experience you ever had! By exfoliating, you remove all dead skin build up allowing your hair to be removed easily. In addition, you can use your “Body Cocktail” several times a week to keep your entire body silky smooth. It will also help eliminate ingrown hairs. 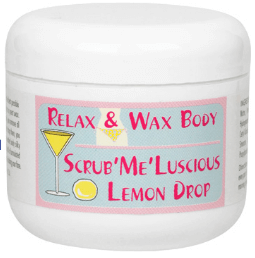 Scrub’Me’Luscious “Body Cocktail” is a water-based scrub that will not interfere with the waxing process. It will not leave your skin oily or greasy. It is safe to use on all body parts, including the face. Scrub’Me’Luscious has a fresh “lemony” scent. Directions: After cleansing your skin in the shower, apply Scrub’Me’luscious to every part of your body and gently scrub. For a great wax, use the night before, or the morning of, your waxing appointment. Use twice a week for all over silky smooth skin. Active ingredients: Magnesium Oxide (polishes away dead skin cells), Butylene Glycol (antimicrobial agent), Hydrogenated Polyisobutene (skin-conditioning agent), Propylene Glycol (a humectant), Titanium Dioxide (filters UVA and UVB rays), Diazolidinyl Urea (an antiseptic), Lemon Oil (reduces inflammation and works as a natural antiseptic).